Winter sun Destinations - wheres hot now? If you're wondering where the hottest destinations to travel to this winter are, then you've come to the right place. We've rounded up the sunniest resorts to visit whether you choose to fly before the festivities or book a relaxing break once the last Christmas cracker has been pulled. Browse below and find great-deals on all of your favourite winter sun holiday destinations - with fewer crowds to match! Gran Canaria benefits from a gorgeous year-round climate, which makes exploring its golden beaches, volcanic landscape and traditional whitewashed towns a delight. It might not have the big-time clubbing resorts of sister islands Tenerife and Lanzarote, but its vast sands, mountainous landscape, bijoux resorts and neighbouring hamlets make for perfect family holidays. Climb the spectacular sand dunes in Maspalomas (or explore them via camel-back), bar hop and sandcastle build in lively Playa del Ingles or relax in family favourite Puerto Rico. With temperatures averaging at 23°C in October and 21°C in November, why wait a second longer to fly on your sunshine holidays this winter? Book your holidays in Gran Canaria today - or find out more with our fly away to the Canary Islands guide and settle on a resort that suits you! Tenerife holidays are a fantastic family holiday destination even outside of the main summer season, thanks to lashings of sunshine, low chance of rain and bountiful attractions. The world-renowned Siam Park is sure to keep children happy, especially as it's crowned as one of the best waterparks in the world and open all-year-round, plus there's the popular Loro Parque too. Grown-ups will find the resorts quieter outside of peak summer months, with the best time to visit the island between October and November, when temperatures average at 21°C. Costa Adeje is a plush choice if you like the finer things in life, while sleepy Playa Paraiso offers a healthy dose of laid-back rest and relaxation - and if you want to party, you'll find bars and clubs open in Playa de las Americas' lively resort. And don’t miss out on a trip to the beautiful and bustling port city of Santa Cruz, Tenerife on your sun holidays this winter! Lanzarote is one of the warmest and driest Canary Islands throughout the winter months, which makes it a safe bet for some out of season short breaks in the sun. Hikers who want to explore the Mount Timanfaya National Park will find the weather conditions ideal from October onwards – without too much sweltering in your hiking boots! Whether you choose lively Puerto del Carmen, laid-back Costa Teguise or pretty Playa Blanca, you can guarantee some short haul fun in the sun with Lanzarote holidays. Quieter than its Canary Island neighbours, Fuerteventura holidays are perfect if you're after an "away from it all" escape this winter. Couples and families with young children will love the peaceful vibe, and the resorts remain unspoilt with low-rise hotels and clean sandy beaches. You’ll find the most life in Costa Caleta, Corralejo and Jandia, but expect pretty old towns and fishing harbours too. Much like Gran Canaria, Tenerife and Lanzarote, October and November offer the best months for winter sun holidays, but average temperatures of around 18°C in January and February mean you are likely to get good days during these months too. Aphrodite’s island is a beauty that’s well worth visiting during winter, especially if you’re into your ancient history. Sunshine holidays on Cyprus island is great for those that want blue skies but don't want to sizzle on their spring holidays. The Tombs of the Kings are a must-see, and you can swim around Aphrodite’s rock. In the Paphos region, choose from its pretty namesake town, quiet Coral Bay or livelier Limassol. Or stay in the Larnaca area where you’ll find Protaras, white-sand Nissi Beach and party central Ayia Napa – which is still buzzing during the winter months. The months of October and November serve up the best temperatures for Cyprus holidays during the winter, with a toasty forecast of 20°C. Whether it's the vibrant souks and city sights or the striking red sands you want to escape to, Morocco is a winter-worthy destination. Popular Agadir actually chalks up 300 sunny days a year, with pleasant days during the months of October and November, when temperatures drop just below 20°C. You’ll find great-value luxury hotels both within the medina walls and on the quieter outskirts, or if you really want to escape the hustle bustle of the city, head for the Atlas mountains or sleepy seaside Essaouira to add tranquillity to your trip! Start packing for your sunshine holidays to escape the winter chill! This Mediterranean island and its neighbouring isles of Gozo and Comino, is a dream for those looking for winter sunshine and great atmosphere. Waterside capital Valletta and the ancient Mdina serve up the best kind of history lesson, with palaces, churches and temples to discover - while the pretty coves, cliffs and caves that dot the coastline will take your breath away, too. Try the resorts of St Julian’s and Sliema if you're seeking sophisticated nightlife, or head to the rare sandy beaches at Mellieha for ultimate R&R on Malta island. Bugibba is a perfect family-friendly resort area with fun waterfront amusements and a bustling promenade, or if you're enjoying couples holidays take a boat trip to Gozo for super scuba diving sites and spectacular scenery! Loud and lively Cancun, Mexico, is a classic winter sun destination, with sun-seekers flocking to take their place on the white sand beaches and swim in the turquoise waters of the Caribbean Sea. 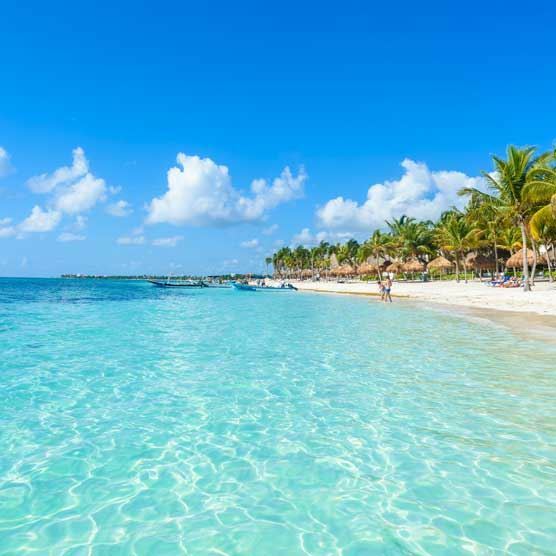 Cancun trips for sun holidays are ideal for those who like to stay occupied with lots to see and do - the adventurous can spend their Cancun holidays visiting offshore Isla Mujeres, where you can swim with dolphins, scuba dive and explore the famous underwater caves. If you like to stay a little drier, shop in shiny malls and downtown markets, hit the tequila bars and stop for a bite to eat by the waterfront, the list goes on and on! Visit between October and March and you'll experience temperatures as high as 24°C, making it a perfect excuse to swap UK drizzle for a healthy dose of Vitamin D. Travel to Cancun on cheap January holidays in the sun and start the year on a sweet note! If you're eager to find out more, here's 10 things you didn't know about Cancun. It’s hot, hot, hot here from January right through to March - and the wealth of hotels to choose from make it a perfect place to rest and relax under a sun umbrella. If the nine hours of sunshine get too much for you, escape beneath the surface of the sea on a scuba dive to the coral reefs or an underwater wreckage. Take a look at our all inclusive luxury holidays in Dominican Republic and get ready for the ultimate winter warmer, whether it’s cheap January holidays or short breaks in the sun! Nowhere does winter sun quite like the dazzling city of Dubai! Bursting with mammoth shopping malls, fringed by brilliant sandy beaches and home to some of the world’s most luxurious hotels and resorts, there are loads of things to do in Dubai for everyone. Seek the souks for a dose of Arabian culture, scale the world-record holding Burj Khalifa and feel the adrenaline rush of a desert safari tour, a Dubai holiday means you’ll never be short for activities to do. Better still, winter is arguably the best time of year to visit with pleasant average temperatures of around 25°C, unlike summer peaks of well over 30°C. Our full board holidays in Dubai are ideal if you're looking for sunshine holidays with fantastic hotel facilities to come back to at the end of the day.